As the name suggests, evaporators are devices that cause a material to evaporate, or enter its gaseous state. Because of their broad range of practical uses, they can be found in a variety of applications, ranging from agriculture to waste management. To illustrate the versatility of these essential devices, we’ll briefly walk you through some of their most common uses and applications below. Evaporators are widely employed in most industries that depend on a constant supply of fluids or chemicals. HVAC systems, for example, use evaporator coils to vaporize compressed cooling chemicals, removing heat in the process. These systems also use condenser coils to exhaust the heat outside, making the entire process much more effective. Heat recovery evaporators are used to convert seawater into clean water in desalination plants. Utility companies tend to prefer these evaporators over alternative solutions because of their simplicity and minimal energy requirements. The end result is lower operational costs. Evaporators are also used in oil fields to separate water and various other compounds from crude oil. 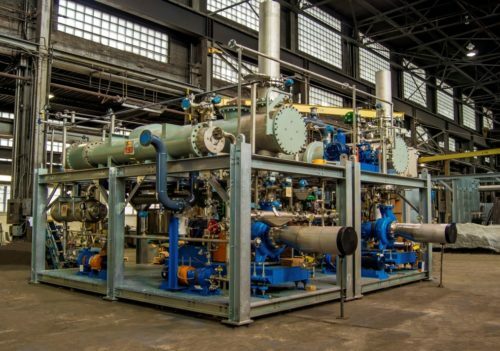 Though more difficult to use than other types of evaporators, these are nevertheless popular among energy companies because they can reduce operating costs while meeting government-mandated standards. Because they are relatively compact, they can also be easily transported to other locations. The food industry employs evaporators to achieve product consistency. Coffee is a case in point. Evaporation is also used to concentrate liquid foods such as noodles and make condensed milk, the product of a process that removes water from milk. Similarly, pharmaceutical companies use evaporators to remove excess moisture from drugs, thus improving product stability. Because of their efficiency, evaporators are well-suited to an array of industrial applications. They are particularly common in processing industries. Food and dairy products such as tomato purees, milk, herbal extracts, gelatin, coconut water, and whey and milk proteins are all processed with the help of evaporators. The same is true for chemicals such as dyes, ammonium nitrate, glycerin, sodium nitrate, paints, and pigments. Evaporators are also ideal for very low temperature applications in the food and pharmaceutical industries. These include the production of plasma, fermented products, coffee extracts, fruit juices, bulk drugs, glycerin, sweet water, yeast extract, and protein hydrolysate. Whey, gelatin, malt extracts, glucose, fructose, dextrose, sorbitol, and maltodextrin are all produced with evaporators, as well. Another field in which evaporators are widely used is waste management. Waste management providers rely on them to treat effluents, or wastewater, from various plants, including distilleries, grain mills, abattoirs, textile plants, chemical reactors, and storage tanks. Designed to serve a variety of practical uses, evaporators are a versatile solution to many common industrial challenges. At Thermal Kinetics, we use our experience and expertise to manufacture evaporators that thrive in any application. Thermal Kinetics works with companies of every size to develop an evaporator that suits their particular needs. Our wide range of products includes falling film tubular evaporators, rising film tubular evaporators, internal pump forced circulation evaporators, caustic and other specialized concentration systems, forced circulation evaporators, and plate stripping and evaporation systems. Regardless of your needs, Thermal Kinetics can supply you with an industrial grade evaporator that minimizes operating costs without undermining productivity. Contact us to learn more about how we can help you find the perfect evaporator for your company. Energy efficiency is frequently achieved through process integration and TKE’s DDE design is no exception. But highly integrated process are sometimes hard to troubleshoot. In every instance in which Calgren has been baffled by DDE process issues and found it necessary to reach out to TKE for assistance, they have responded with sage and knowledgeable advice.